We are full of Christmas Spirit! Lisa and Heather are showing off their work of art as the Festival of Trees gets under way. What’s the Festival of Trees, you ask? It’s an event that started 29 years ago in Vancouver, and it’s purpose is to raise funds for the BC Children’s Hospital Foundation. Since it’s inception it’s grown throughout several communities in BC, including Osoyoos for the last several years. And this year the Oliver Osoyoos Winery Association was pleased to announce the spread of it’s Festival to have trees sponsored and showcased throughout Oliver as well as Osoyoos. “The Festival is open to the public who are invited to browse through the holiday displays at four locations this year and enjoy the holiday splendour. 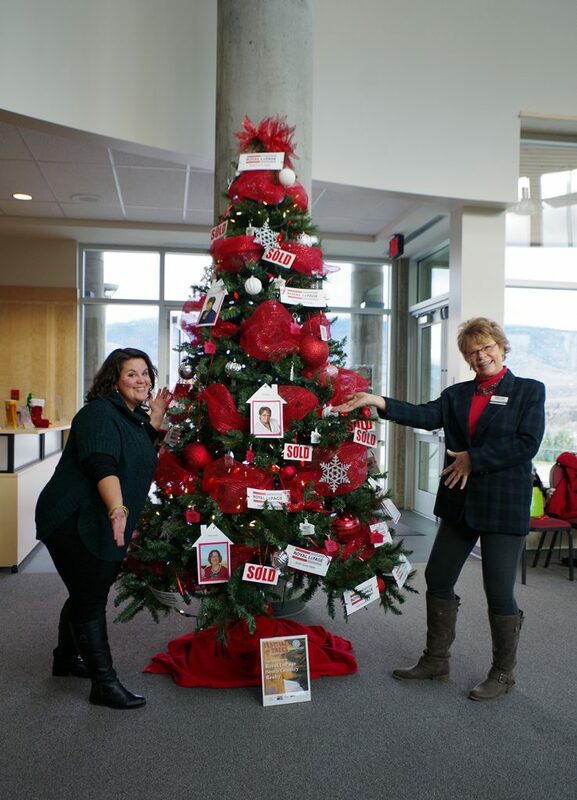 This year Festival of Trees is being shared between our two communities of Oliver and Osoyoos with trees on display at Nk’Mip Cellars Winery, Watermark Beach Resort, Frank Venables Theatre Lobby and Baldy Mountain Resort. There is no admission for this event and everyone is encouraged to come and vote for their favourite tree; a minimum donation of $2 is requested. Donations over $25 BC Children’s Hospital (BCCH) will issue tax-receipts. Ours was only one of the beautifully decorated trees being prepared to be showcased at the Frank Venables Theatre between November 25th and January 4th. So be sure to get out and see the trees, vote for your favourite, and help raise funds for this immensely worthy cause.